It is the traveler's responsibility to obtain the necessary passport and visa for entry to Spain. Toledo is served by Madrid-Barajas Adolfo Suárez International Airport, one of the major hubs in Europe connected with cities all over the world. Toledo is easily reached from the airport using a commuter train to Madrid Atocha train station and then a high-speed train to Toledo. Travel time from Madrid to Toledo is approx. 30 minutes. You can move around the city of Toledo by walking, since the distances are affordable (20-40 minutes depending on the destination), nevertheless, one must be willing to go up and down hills if you choose this option. To help in this aspect, there are two pedestrian escalators to the top part of the city. The Campus (Campus of Fábrica de Armas) is located down by the river. You can reach it by walking from the old town and surroundings, or by urban bus or taxi. Practically all the urban bus lines arrive/depart at Corralillo de San Miguel (next to the Alcázar and Plaza de Zocodover). If you choose traveling by urban bus, you can take bus line 4.2, which stops at the main door of the Campus. The urban transport company is UNAUTO, you can install the app Bus Toledo (in https://play.google.com/store/apps/details?id=com.gmv.bustoledo2&hl=en) or visit its website http://unauto.es/tiempos-de-llegada/. 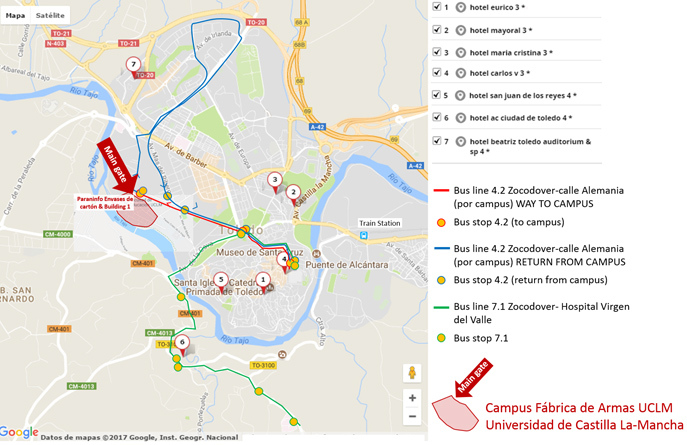 If you plan to stay at Hotel AC, you will need to take two urban buses, bus line 7.1 to Arrabal (Puerta de Bisagra), and then take bus line 4.2 to the Campus. If you decide to stay at Hotel Beatriz you will need a car or a taxi to get to the campus. There is a field outside the Campus where you can park your car, since the entrance of cars into the parking of the Campus is restricted to employees of the university. If you’re having a simple meal in the daytime then you should consider leaving a tip of around one euro per person. For evening meals, restaurants won’t generally expect you to tip, but if you have received particularly good service and you’ve had a good time, then a gratuity of 5-10% is reasonable. Alternatively: Personal laptop computers may be used, but you must ensure compatibility with the LCD projector prior to the start of the session. Also bring a memory stick as a backup. Overhead projectors will not be supplied except upon special request at least one month before the conference and at the speaker's expense. The conference will be held at the Technological Campus of Fábrica de Armas, of the University of Castilla-La Mancha. It stands on the site of the former facilities of the weapons factory of Toledo and has adopted the same name. One of the most distinctive university campuses currently in Spain, it comprises more than a dozen rehabilitated and restored buildings, with the Sabatini Building as a focal point.. There is free parking opportunity nearby the conference center.